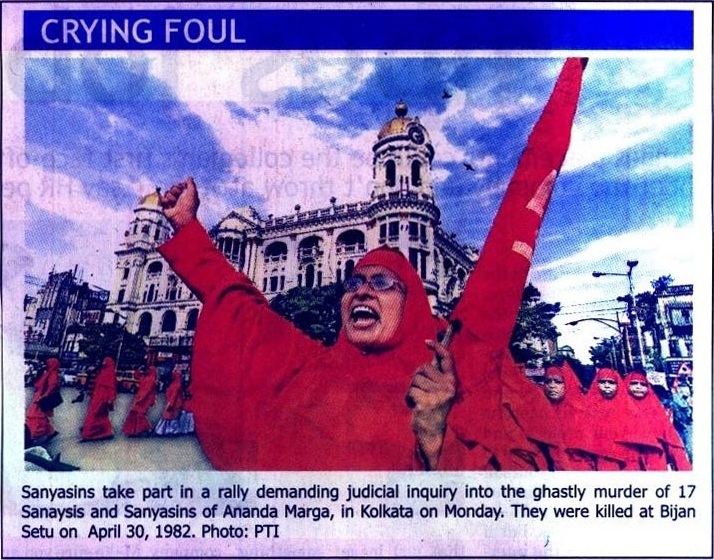 (Kolkata, September 12, 2011) – The Ananda Marga organisation took out an impressive procession of thousands of its devotees and sympathizers for the demand of a Supreme Court inquiry into the gruesome murders of 17 of its whole time workers in Kolkata in 1982. The then ruling communist party is believed to have been behind the atrocities and persecution of the Ananda Marga mission. The Additional District Magistrate of 24 Parganas, Kolkata where the murders took place, Mr. Sheer Singh, recently declared that the murders were carried out because Ananda Marga promotes PROUT. The murders were never properly investigated and Singh was removed from his post for protesting it. “Very powerful persons are implicated in the Bijan bridge massacre. Unless a judicial authority of very high repute like that of a sitting Supreme Court judge is appointed to conduct the enquiry, the truth may never come out,” an Ananda Marga spokesperson said. It was pointed out that the Marga had addressed the new West Bengal Chief Minister Mrs. Mamata Banerjee several times in the matter but had not received any reply so far. In a public meeting following the procession, a large number of academic and civil society representatives expressed their all-out support to get a proper inquiry into the 1982 murders. 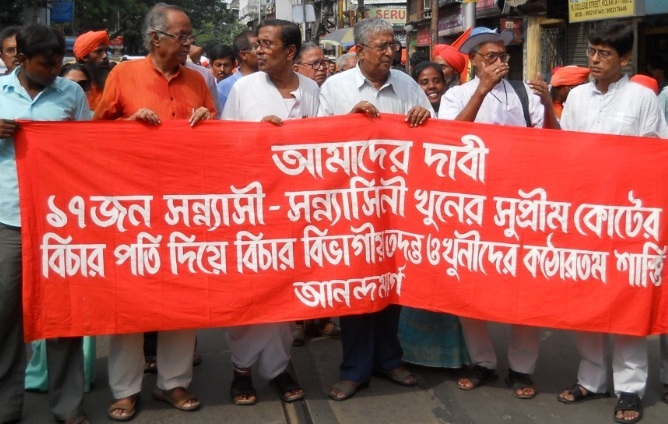 Representatives of the Marga declared that their campaign for the demand will continue through more and more processions, public meetings, street corner meetings all over India in general and in West Bengal in particular. The Ananda Marga organisation will now approach the President and Prime Minister of India regarding the institution of the inquiry. all persons who believe in humanity are ashamed by this cowardly act of the communists and west bengal Govt.